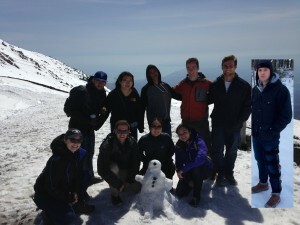 On our last full day in Sicily, we visited the awe-inspiring Mount Etna, the largest active volcano in Europe. The contrast of black volcanic rock against pure white snow made it feel like we had stepped foot on an entirely new planet. On the way to Porto Empedocle, we stopped at the House-Museum of Luigi Pirandello. Born in 1867, Pirandello was a famous Sicilian playwright, novelist, and (as we learned in the museum) a talented painter. 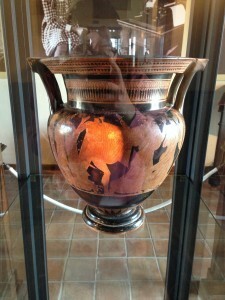 On the second floor of the museum, I was shocked to see a Greek vase sitting in a glass case in the center of the room. Finally, a crossroads for the Italian and Latin class! The vase, as we learned from Professor Boyd, depicts the story of Tereus, Procne, and Philomela, a rendering of which is found in Ovid’s Metamorphoses Book VI. According to Ovid, Procne requested that her husband Tereus, the king of Thrace, fetch her sister, Philomela, from Athens. Tereus obeyed, but as he escorted the sister back to Thrace, he locked her in a cabin and raped her. When Philomela threatened to reveal Tereus’ crime, he cut out her tongue. The now mute Philomela wove a tapestry depicting the wicked act and tricked a servant into delivering it to Procne. As revenge, Procne murdered her own son, Itys, and served the child as a meal to Tereus. The story concludes with all three characters going mad from the traumatic events they had experienced, and the gods transform all three into various birds. 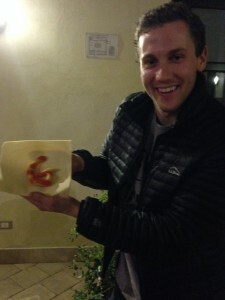 In Erice, Professors Boyd and Gavioli surprised us with a baking class taught by local hometown hero, Maria Grammatico. 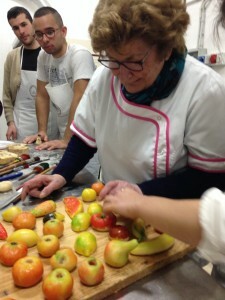 Maria and her assistants showed us how to make Frutta Martorana, or marzipan fruit. Throughout Sicily, one can find this pastry in various shapes and forms: as bananas, tomatoes, apples, pears, oranges, watermelon, etc. Maria’s recipe called for a kilo of blanched Sicilian almonds, a kilo of granulated sugar, some water, and a bit of vanilla and almond extract. 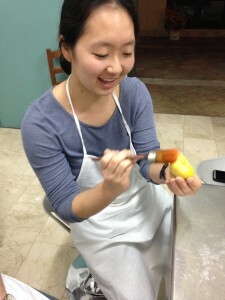 Maria provided us with 50+ year old molds to shape the marzipan dough into fruits. 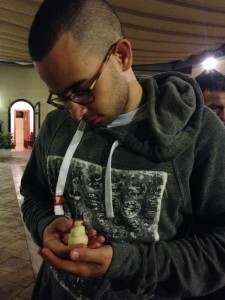 David and Greg, however, took the road less traveled and got creative with their creations. Once the almond paste was molded, we painted the shapes with a yellow base, then added red, green, and orange as we saw fit. 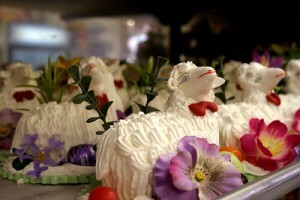 Since we were traveling days before Holy Week, we frequently saw little lamb-shaped pastries in bakery windows. I learned from Maria that these were also marzipan pastries, called pecorelle pasquali, a favorite in Sicily around Easter time. On the fifth day, we departed the misty Erice early in the morning to head to the ancient Greek city of Selinunte. Selinunte plays an important role in our readings from Book 6 of Thucydides’ Peloponnesian War, as it is strife between Selinus and Egesta which incites the Egestaeans to seek out Athens’ assistance in war. Needless to say, we Classics enthusiasts were pretty excited to explore this impressive archeological site. Within the acropolis of Selinunte lies a remarkable mosaic of the Phoenician goddess, Tanit (pictured above). Although it is perhaps not aesthetically pleasing, this mosaic provides important evidence of a Carthaginian presence in Selinunte. The image depicts the goddess standing between two staffs of some sort. She is often depicted as a stick figure, as seen here. Tanit is typically associated with prosperity, commerce, and trade. For this reason, she served as a patron of the Carthaginian sailors who were conducting trade across the Mediterranean sea. 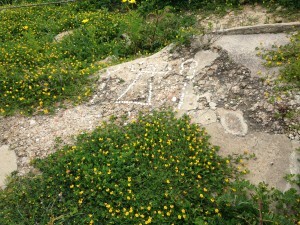 This image in the pavement was likely before the entrance of a home. It might have provided good luck for an ancient Carthaginian businessman who once lived here in Selinunte. In the beginning of Book V of The Aeneid, Aeneas and the Trojans sail away from Dido and the kingdom of Carthage. Although they seek Latium, the promised land, a storm pushes them east and they head towards the shores of Eryx in northwestern Sicily (“litora fida…fraterna Erycis portusque Sicanos” the friendly, brotherly shores of Eryx and Sicilian habors: lines 23-24). 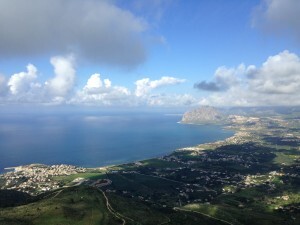 Eryx is known today as Erice, renamed by “lover of Classics,” Benito Mussolini. As the Trojan ships pull into shore, Vergil notes that Acestes observes them from the top of a hill overlooking the sea (“ex celso miratus vertice montis adventum…Acestes” from the lofty peak of a mountain, Acestes wondered at their arrival lines 35-36). He also describes the shore as being surrounded by woodlands (“consonat omne nemus” the whole forest made noise: line 149). In addition, during the boat race, we learn that sharp rock ridges that jut out into the water (“procurrentibus saxis” rocks jutting out: line 204; and “acuto in murice” in the sharp shellfish/rockridge: line 205) line parts of the shore. I fantasized that the view (pictured above) from the hill which we were climbing was the same sight which Acestes himself would have taken in as he saw the Trojans ships approach his shores. I traced my eyes along the rocky coastline and imagined the boats of Mnestheus, Gyas, Sergestus, and Cloanthus racing to finish in first place. The twenty or so minutes climbing up this hill very well might have been my most cherished twenty minutes of the entire Spedzione Siciliana.